I think I’ve said this before, but I’ll say it again: I really, really, enjoy paranormal romance! Like, a lot. It’s been months since I read the first book of this series, and I was jumping with joy when I got the second installment. I remember lots about the first book, but most of all I think I remember how I felt. I remember that I felt worried, proud, angry, all swoney, and stuff… And incredibly pleased because I love how this author writes diversity. I absolutely adore it. So here we have Henry and Vincent. These two boys now have a partership along with Jo and Elizabeth. There is a new adventure for them, where they have to travel to investigate and hunt a ghost that has been harming the people in town. I loved the plot. Most of the times I found myself surprised. Others, it was a bit easier to more or less predict what would be coming. There is an amazing element of mystery that I adored, and don’t even get me started on how much I loved the ghost story. It was heartbreaking, sad, enraging, and … in a way, weirdly beautiful. Ok, no, maybe not… Or yes? Gah! I mean, you’ll see what I mean when you read this book. I loved the romance element… I think that in a way this was a bit unconventional? Atypical? Gosh, I don’t know. We got to see both Henry’s and Vincent’s sides. We got to see their fears and insecurities, and that made them even more human to my eyes. We also got to see how wonderful of an influence they are for each other. We see how, sometimes, expectations… Harm. It was a long run for these two. My only problem is that I really don’t deal well with lies. I’m not a fan of liars in general, and I always find it extremely difficult to justify a lie. While I could see the reasoning here, and say, yeah well, i’d feel the same… I just couldn’t completely forgive that it went on for SO long. I love the villain in this story. The perfect villain. I ended up hating him, as it should be. Ha! One of the things that I also love about Jordan L. Hawk’s writing is that she writes the most awesome and badass female characters. I adore Jo. She’s absolutely loyal and honest. She stands by what and who she believes and no one can move her from there. She is smart, and just… amazing. I love her story, and the more I read about this series the more I want to find out about her. Elizabeth is also another of my favorite female characters. She’s incredible. She’s strong, and direct. She’s dead honest. She’s faithful to those she cares for. Like Jo, she stands for those she loves and for what she believes in. It’s just a joy to read them both, and I wish we could see more of her in future books, as well. 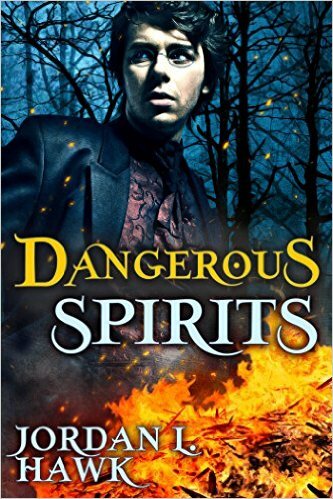 This entry was posted on September 23, 2015 by Gaby in PNR / UF / SF / DYS, Reviewer: Gaby and tagged 4 Stars, Dangerous Sprits, Diverse Characters, Jordan L. Hawk.